Whipper Snapper is one of Australia’s newest whisky distilleries. While its whisky quietly sits maturing in barrels, the distillery has decided to release some of its new make spirit into the market. This new make spirit is creatively named Crazy Uncle Moonshine. Being “new make”, Crazy Uncle Moonshine is spirit and not whisky. It is put in bottles right after Whipper Snapper distill their wash (fermented grain, similar to a beer), without first putting the spirit in oak barrels to get colour or flavours from oak. This is a fairly common practice for start-up distilleries, which try to sell either gin or vodka to inject their businesses with cash. In this case Whipper Snapper have released their new make, which is basically vodka without filtration through carbon or lots of polishing (this means the new make tends to retain more of the grain flavours from the wash). Crazy Uncle Moonshine immediately strikes me as quite a clean new make, beaming with that nutty and husky grain typical of newly distilled grain spirit but softened by underlying hues of crusty bread, pitted Kalamata olives, sugary honey, vanilla, plum jam and blackberry confectionery with mint toothpaste and anise notes. The ethanol seems more pronounced on the palate and the alcohol itself is very sweet and sugary, though what is perhaps most interesting about this new make is its apparent design – heavier more pungent alcohols commonly found in the lower tails of a distillation run seem to have been kept at a minimum, while cleaner and lighter (but not necessarily better) spirit seems to have been preferred. The spirit itself is quite sweet on the entry, and then dries with a bitter bite at mid-palate which fades into a pleasantly long finish of re-surging sugars. Overall, Crazy Uncle Moonshine is an impressive new make spirit that is easy to drink either neat, in a mixed drink or in a cocktail. It is the kind of spirit that holds up quite nicely in a tumbler mixed with lemonade, a wedge of lime and some sprigs of fresh mint but it is neither a whisky nor the typical example of a vodka – do not expect the oak driven complexity of a whisky or the super polished neutral ethanol rich profile of most vodka. This is grain spirit, so those grain notes do tend to shine through most mixers. While this is very good new make, it is still new make – the boring younger version of whisky before it is placed in oak to mature. 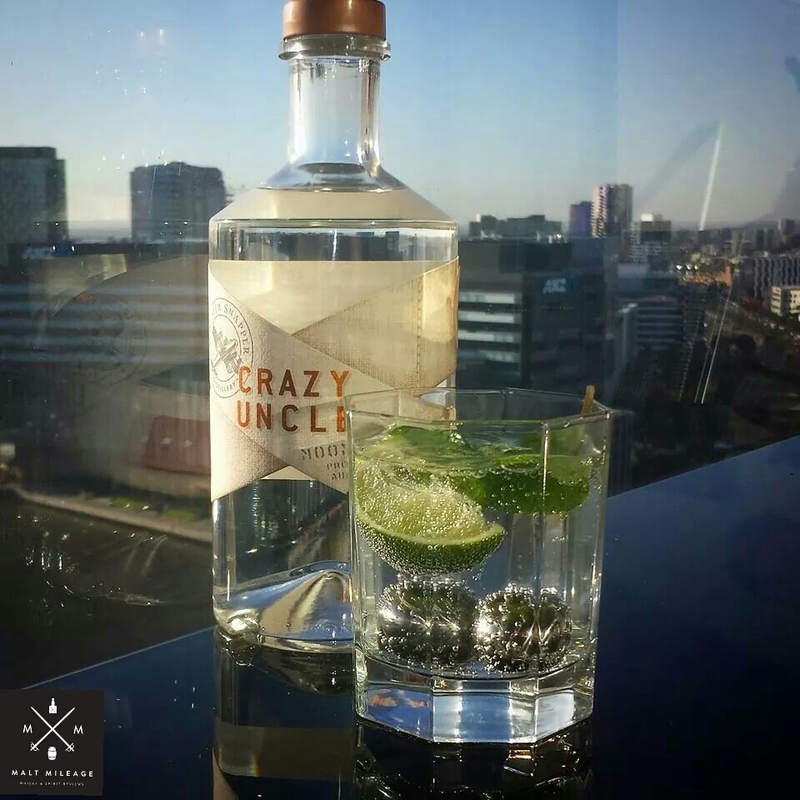 Crazy Uncle Moonshine is not something I would buy, but it does offer a glimpse into Whipper Snapper’s new make spirit and the flavour profile of the distillery’s signature character. If it is any indication of what the distillery is putting into barrels for maturation, I cannot wait to see the finished product. This is a new make that I think would mature nicely in oak barrels, but in my opinion it will be quite prone to becoming over-oaked. I will keep my fingers crossed that the distillery nurtures this excellent new make correctly so that it grows up to become a delicious mature (not woody) whisky (or perhaps a “whiskey” with an “e”, as Whipper Snapper have opted to spell the it). Whipper Snapper just might bring about some competition in the years to come. I am definitely going to keep my eye on this distillery, because its new make is impressive. I hope its wood policy and maturation is just as good. This entry was posted in Australian whisky and tagged Australia, Crazy Uncle, Whipper Snapper. Bookmark the permalink.